Recombinant monoclonal antibody to Polysialic acid. Manufactured using AbAb’s Recombinant Platform with variable regions (i.e. specificity) from the hybridoma 735. Immunogen: Homopolymers of α2,8-linked sialic acid of Escherichia coli K1. Specificity: Recognises Polysialic acid (PSA), a carbohydrate polymer attached to the neural cell adhesion molecule (NCAM), which shares molecular epitopes with homopolymers of α2,8-linked sialic acid of Escherichia coli K1. Application Notes: This antibody recognises an unusual postranslational modification on neural cell adhesion molecules important in synaptogenesis, oncogenesis (particularly small-cell lung cancer) and development of organs such as the kidney (studied in rats, Lackie et al. 1990). In addition to various studies on human cells, the antibody, has also been used the study the fine-composition of poly-sialic acid composition in mice (Galuska et al. 2006). Note on publication: Describes the generation of this antibody. 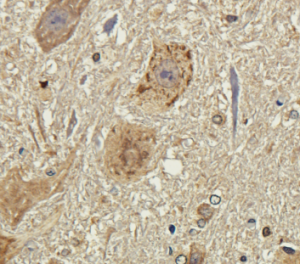 IHC on guinea pig brain using Ab00240. 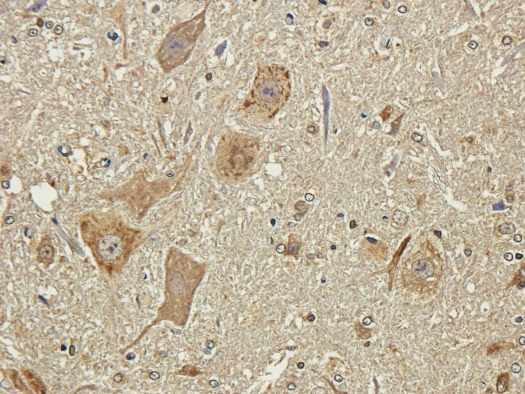 Immunohistochemical staining of guinea pig brain using anti-polysialic acid antibody Ab00240-23.0 Formalin fixed guinea pig brain slices were were stained with a Ab00240-23.0 at 3 µg/ml. 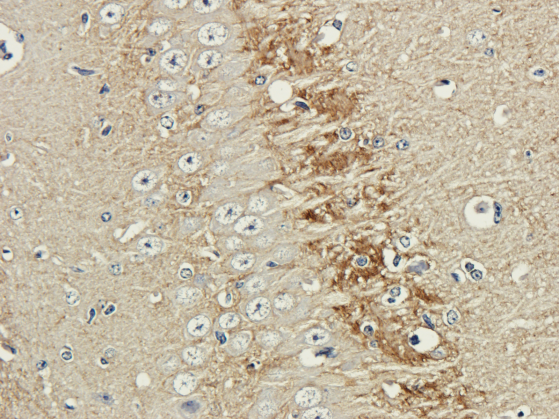 IHC on rat spinal chord using Ab00240. 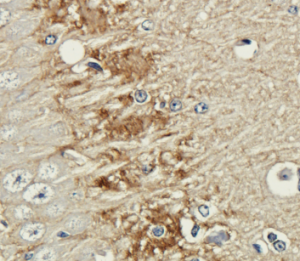 Immunohistochemical staining of rat spinal chord using anti-polysialic acid antibody Ab00240-23.0 Formalin fixed rat spinal chord slices were were stained with a Ab00240-23.0 at 3 µg/ml. WB on rat brain using Ab00240. Western Blot using anti-polysialic acid antibody Ab00240 Rat brain lysate was resolved on a 10% SDS PAGE gel and blots probed with Ab00240-23.0 at 2 µg/ml before being detected by a secondary antibody.